With the five co-owners of Papa Charlie, our 1978 Piper Turbo Arrow III, we had spoken for some time to flying to Dakar tracing back the routes of the famous Aeropostale of de Saint-Exupéry and Mermoz. We thought this was a crazy, reckless and expensive idea. But then one night, after some wine, we just decided to do it ! 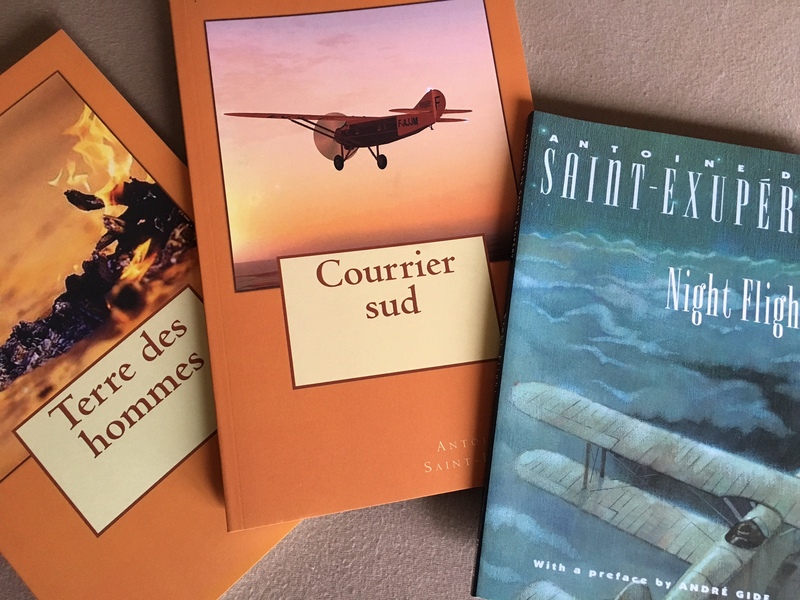 The next day, I ordered a couple of old books from de Saint-Exupéry and Mermoz just to get into the mood. Once we had made that decision, we understood that a lot of preparation would be required. The dates had to be picked and agreed upon amongst five busy individuals. All maps and charts had to be found and prepared. We prepared the route, closely following that of the famous Aeropostale. We also found out that we needed to request overflight and landing permissions, and maybe even visa. And what about survival if something would go wrong with and we have to crash-land in the desert? 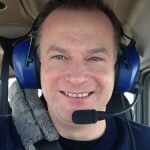 Is Avgas, our airplane’s fuel, everywhere available? Is the airplane ready for such a long journey? Let’s have a look at our preparation one by one. 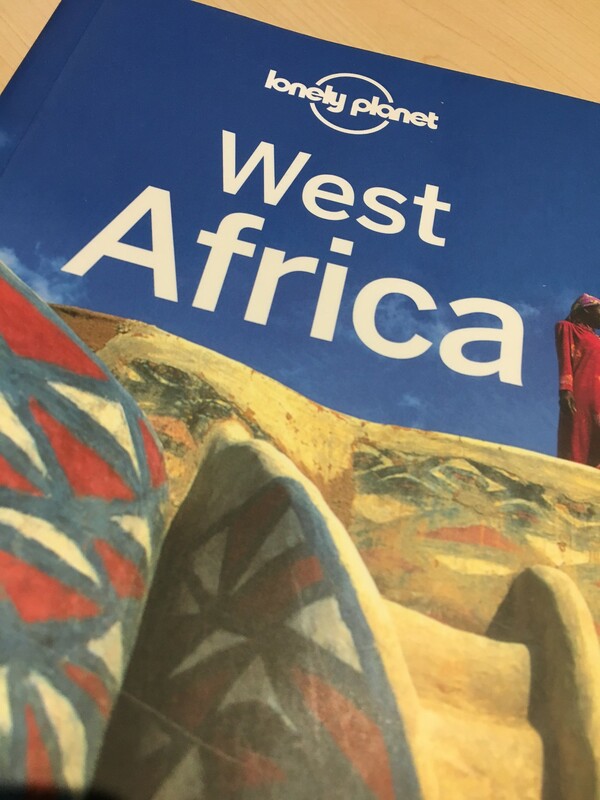 As a general prep, I ordered the Lonely Planet of West-Africa. 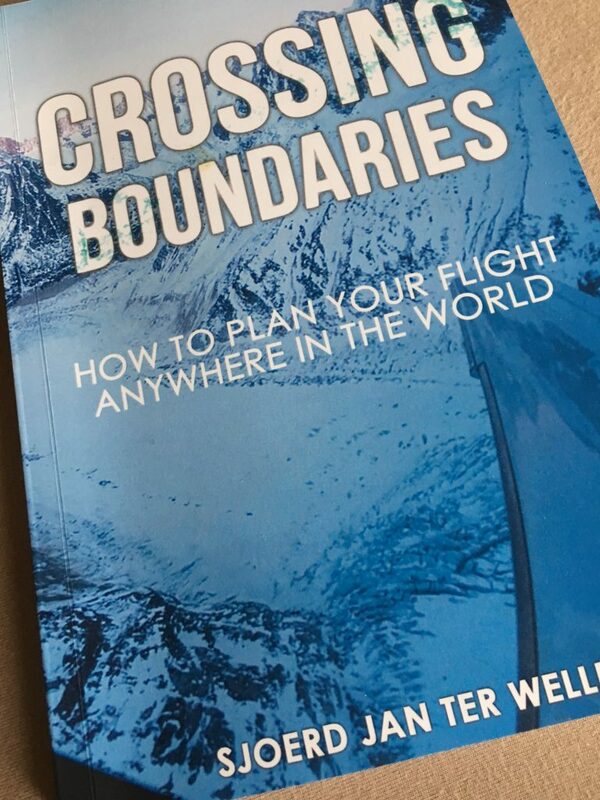 I also read the Across Africa blog and Crossing Boundaries book by Aeroplus, a Dutch private pilot who has been flying in Africa and documenting his efforts. We used our virtual Google Drive to post all our documents, and we had dinner all together to plan the details of the trip. Picking a suitable period amongst five busy individuals, taking climate into account as well as scheduled airplane maintenance is no easy job. Worst part: it is my schedule which is the most critical. So in search of a good date, and in view of my too busy professional life, I even gave probabilities to certain weeks indicating the chance of me being available. We settled on the first two weeks of October 2016: the airplane was in need of its 100 hour maintenance in September, all of us could make themselves available in one way, shape or fashion, and the climate particularly over the Sahara desert is supposed to be benign at that time of the year. The idea is for Luc and Fanfan to fly first southbound, pick up Bruno along the route and continue with three till Dakar. Luc and Fanfan fly back by airliner. Fred and myself fly via airliner to Dakar in the second week of October 16, and continue with Bruno northbound back home. We drop Bruno off somewhere in the middle. 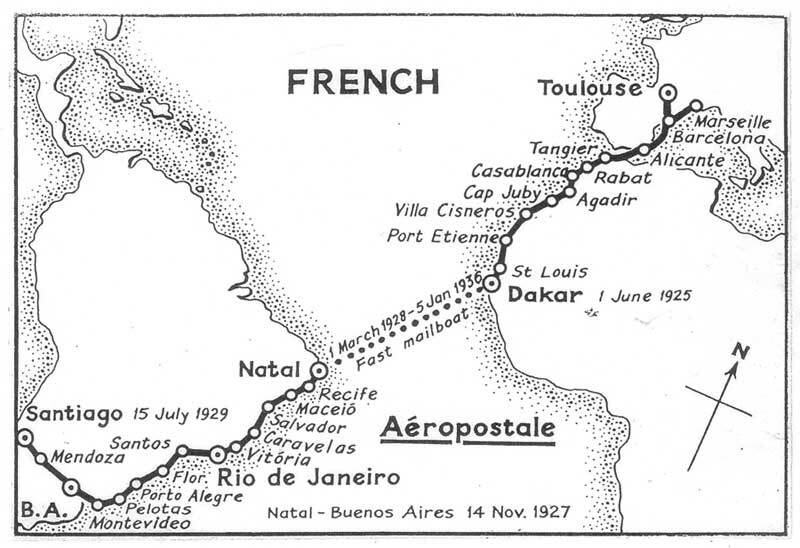 The Aeropostale route starts in South-France, follows the coast of the Mediterranean in the east and south of Spain, crosses over to Africa in Gibraltar and continues along the Moroccan coast towards the Western Sahara (disputed part of Marocco), Mauretania and Senegal. It used to continue across the Atlantic towards Brazil, but we will stop in Dakar. Our intention is to follow this route closely. The going route has been prepared by Luc & Fanfan. As I write this, they are flying between Biarritz and Tanger across Spain. Total distance will be 2700 NM, less then 22 flight hours, to be divided over three pilots. The idea is to fly VFR as much as possible, and only IFR is really needed. For Marocco, their online AIP is very comprehensive. We found all VFR and IFR enroute charts, which we printed out in its native format. All aerodrome charts are available there as well. The IFR approach charts are obtained by means of a Spain/Portugal Jeppesen tripkit, and by asking a friend fro printouts of those airports not covered by Jeppesen. For Sénégal, the only official source we found is the ASECNA website. This also covers Mauretania. IFR approach charts were obtained through my friend. Mauretania themselves also have an AIP online. The funny part of that website is that is says “Hacked By islamic State Army” – very promising ! I found much information there, but I missed a normal VFR chart. I asked help to the Euroga.org community, and they provided me with links to scans of the classic American ONC & TPC charts, dating back from the eighties ! They are very detailed maps, but miss up-to-date aeronautical data. Based on the AIP information, I set out to update those TPC charts by hand and indicate all pertinent modern information onto those charts – I love this ! We quickly learned that in order to fly in Africa, we would have to deal with a heightened level of bureaucracy. 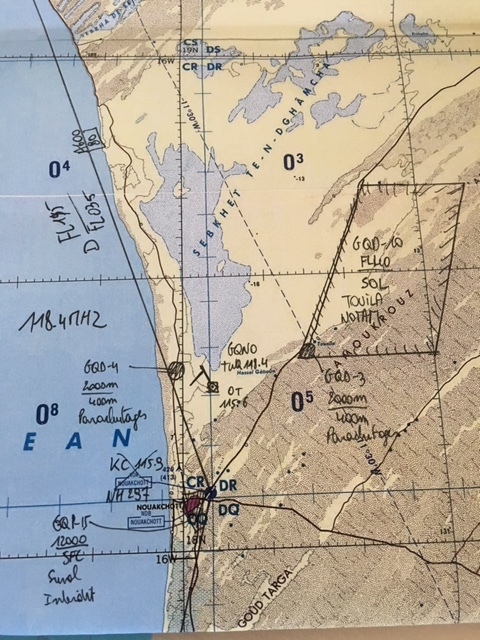 Flying and landing in disputed area of Western Sahara will require approval from Marocco. Overflying Mauretania and Senegal, idem dito from their authorities. We decided to obtain these permissions ourselves and divide that workload amongst us. Luckily, these processes are more or less documented in the respective AIPs, so we set out emailing, faxing and calling the authorities. I took care of the overlfight and landing permit for Mauretania and its capital Nouakchott. We were supposed to send all available documents for the airplane, its pilots, insurance etc. Email didn’t work very reliably, so I set up an online fax account and tried every listed fax number I could lay my hands on. Eventually I made contact through mail and phone, and after some forths and backs, I obtained our permission for Mauretania. And finally, Mr. Karim from the Maroccan authorities also gave his fiat. We also checked if we needed visa and read our government’s travel advisories. No visum for Senegal and Marocco required, but we will need one for Mauretania, which, so we have been told, can be obtained upon arrival. We plan to check in into the country as “air crew” nevertheless. 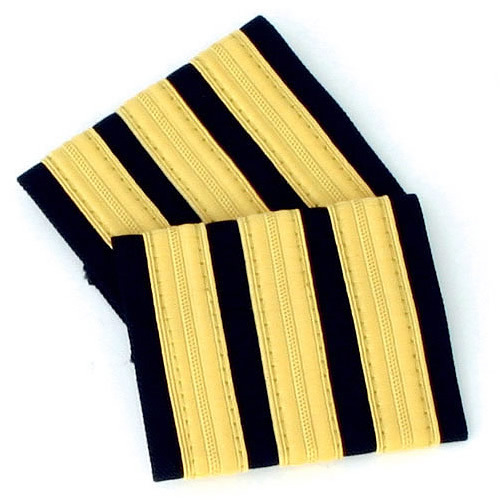 And I plan to fly with a pilot’s uniform, just to make a good impression onto the authorities. I have to admit, I am a little scared to have to do a crash or precautionary landing in the desert in Africa. Getting stuck without too much help at hand, made me prepare thoroughly for this eventuality. 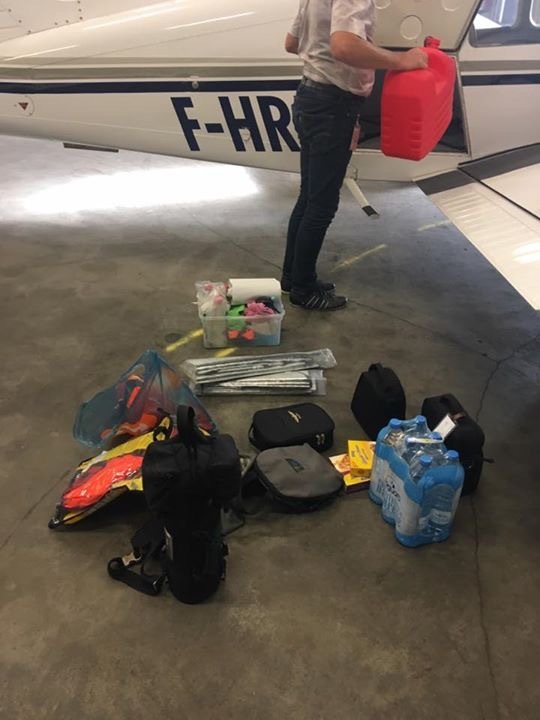 Radio coverage is not good, and Search-and-Rescue services are far in between, so when we do land outside an airport, we will have to be able to survive at least a couple of days. All that survival gear left already for Africa. and a plastic recipient for emergency in-flight pipi ! For the rest, we plan to travel light so we nicely stay within the W&B envelope of our Arrow. Avgas, the airplane’s fuel, is difficult to find where there is no active general aviation activity. So we checked all airports upfront, and they all more or less confirmed that they do have AVGAS. We plan to take 20L spare AVGAS along, knowing very well that we cannot replenish this 20L when flying. If needed, we can also fly very economical: its maximum no-wind, no reserve range is 880 NM with a full tank of 272L. The airplane, our 1978 Piper Turbo Arrow III, registered as F-HRPC (hence Papa Charlie), has just received its 100 hours check, and passe without problems. Fresh oil and a new tire make him very fit to fly this long distance. Fred had some foams made so we can close off his nostrils when sitting in the desert sand. Although we looked up some possible hotels, we decided we would leave those to the spur of the moment ! No reservations ! Status: I just heard that Papa Charlie has safely landed in Tanger, Marocco. Our African adventure has started. Stay tuned and I will update you about the return flights. Steven !! PAPA CHARLIE is now in Saint Louis Senegal ! Ready to trip back with you !